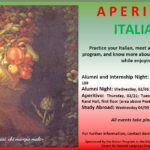 Students who minor in Italian Studies are expected to achieve intermediate proficiency in oral and written Italian, to demonstrate a general understanding of the history of Italian literatures and cultures, and to develop an awareness of the ways Italian studies intersect with other disciplines. All minors are expected to consult the Director of Undergraduate Studies about their choice of courses. Students are encouraged to participate in the Vanderbilt in Italy program. ___ ITA 2501W Grammar and Composition (Prerequisite ITA 2203 or equivalent) OR ITA 2614 Conversation (Prerequisite ITA 2203 or equivalent). Only 3 of these elective credit hours may be selected from courses in subject areas other than Italian, such as Classical Studies, History, History of Art, Music Literature and History.